One common misconception about real estate websites is that it needs to be the Mona Lisa before you start promoting people to go to it. However...aesthetics are not the reason somebody goes to (or leaves) your real estate website. They go to your website to find HOMES. This should be the primary objective with your real estate website. Capturing buyer and seller leads will justify the investment you put into the existence of the site. Does your website effectively capture leads? Meaning, does it ask the visitor the correct questions, and ask for the appropriate information? And is this done in a way that it is not to lax or strict to scare away potential leads? When you capture a lead? Where does that lead go? The most effective websites will add that lead to a contact list. The sites doing fantastic with lead conversion are adding those new contacts into a drip email campaign to continue to nurture those leads and encourage them to return to your site! Your site gets additional points if there is Facebook nurturing through automation as well. The best way to establish your self as the local real estate resource is to blog. Google will crawl your website, and start suggesting you to locals typing in "Home for Sale" in their search bars. Don't have time for blogging? The best websites do this for you! 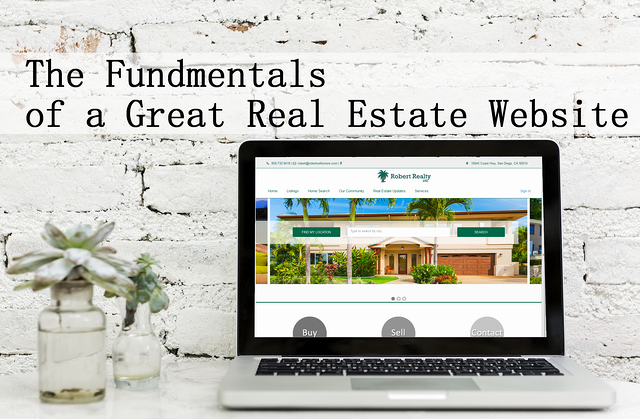 The whole point of a real estate website is to be your online storefront. Stop thinking of it as your "online business card". For a store to be successful, it must be inviting and have an inventory filled with the products that shoppers are looking for. For buyer leads, they are looking for homes for sale; and seller leads are looking for home values. If your website is missing these, you may want to rethink your internet marketing. Or perhaps you have all of these as separate products? It's difficult for the products to communicate with each other if they are indepenent of each other. The quintessential solution to this is to look into a program that provides each of these in a synchronous management tool. What can you do now? How about trying our Facebook Posting Tool for FREE? Click below!